The Natural History of Stafford-Shire. By Robert Plot, LLD. Keeper of the Ashmolean Musæum and Professor of Chymistry in the University of Oxford. Ye shall Describe the Land, and bring the Description hither to Me. Joshua 8. v. 6. Oxford printed at the Theatre, Anno M. DC. LXXXVI. (1686). The purpose of this article is not to analyse the text and its content but rather to identify and clarify the reasons behind the importance of this volume in the context of Masonic bibliography and history. Robert Plot (1640-96) was born in Kent and received a BA degree from Oxford University in 1661, an MA in 1664 and a Law degrees in 1671. In 1677 he was elected a Fellow of the Royal Society and became Secretary in 1682. He was responsible for the publication of Nos. 143 to 166 of The Philosophical Transactions of the Royal Society. In 1683 Elias Ashmole appointed him as the first keeper of his museum, the now well known Ashmolean Museum and Bodleian Library in Oxford. Although there for just seven years, Plot acquisitioned a vast collection of what were considered natural curiosities, many of which he had described in both his histories of Oxford­shire and Staffordshire. These objects are still today preserved in the Ashmolean Museum. He did not complete his life ambitions to write, as he intended, the Natural Histories of Kent and Middlesex for which several extensive MSS survived him. He achieved many more distinctions before his death on April 30th 1696. Robert Plot was not a freemason. 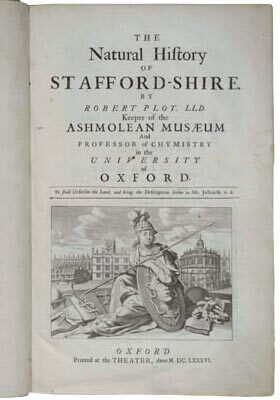 His love was the study of natural history and this is reflected in his publications, including the folio size Natural History of Staffordshire printed in Oxford in 1686, the subject of this article. §85. To these add the Customs relating to the County, whereof they have one, of admitting Men into the Society of Free-masons, that in the moorelands of this County seems to be of greater request, than any where else, though I find the Custom spread more or less all over the Nation; for here I found persons of the most eminent quality, that did not disdain to be of this Fellowship. Nor indeed need they, were it of that Antiquity and honor that is pretended in a large parchment volum they have amongst them, containing the History and Rules of the craft of masonry. Which is there deduced not only from sacred writ, but profane story, particularly that it was brought into England by St. Amphibal, and first communicated to S. Alban, who set down the Charges of masonry, and was made pay­master and Governor of the Kings works, and gave them charges and manners as St. Amphibal had taught him. Which were after con­firmed by King Athelstan, whose youngest son Edwyn loved well masonry, took upon him the charges and learned the manners, and obtained for them of his Father a free-Charter. Whereupon he caused them to assemble at York, and to bring all the old Books of their craft, and out of them ordained such charges and manners, as they then thought fit: which charges in the said Schrole or Parchment volum, are in part declared: and thus was the craft of masonry grounded and confirmed in England. It is also there declared that these charges and manners were after perused and approved by King. Hen. 6. and his council, both as to Masters and Fellows of this right Worshipful craft. §86. Into which Society when any are admitted, they call a meeting (or Lodg as they term it in some places) which must consist at lest of 5 or 6 of the Ancients of the Order, whom the candidates present with gloves, and so likewise to their wives, and entertain with a collation according to the Custom of the place: This ended, they proceed to the admission of them, which chiefly consists in the communication of certain secret signes, whereby they are known to one another all over the Nation, by which means they have maintenance whither ever they travel: for if any man appear though altogether unknown that can shew any of these signes to a Fellow of the Society, whom they otherwise call an accepted mason, he is obliged presently to come to him, from what company or place soever he be in, nay tho’ from the top of a Steeple, (what hazard or inconvenience soever he run) to know his pleasure, and assist him; viz. if he want work he is bound to find him some; or if he cannot doe that, to give him mony, or otherwise support him till work can be had; which is one of their Articles; and it is another, that they advise the Masters they work for, according to the best of their skill, acquainting them with the goodness or badness of their materials; and if they be any way out in the contrivance of their buildings modestly to rectify them in it; that masonry be not dishonored: and many such like that are com­monly known: but some others they have (to which they are sworn after their fashion) that none know but themselves, which I have reason to suspect are much worse than these, perhaps as bad as this History of the craft it self than which there is nothing I ever met with, more false or incoherent. §87. For not to mention that St. Amphibalus by judicious persons, is thought rather to be the cloak, than master of St. Alban; or how unlikely it is that St. Alban himself in such a barbarous Age, and in times of persecution, should be supervisor of any works; it is plain that King Athelstan was never marryed, or ever had so much as any natural issue; (unless we give way to the fabulous History of Guy Earl of Warwick, whose eldest son Reynburn is said indeed to have been marryed to Leoneat the supposed daughter of Athelstan, which will not serve the turn neither) much less ever had he a lawfull son Edwyn, of whom I find not the least umbrage in History. He had indeed a Brother of that name, of whom he was so jealouse though very young when he came to the crown, that he sent him to Sea in a pinnace without tackle or oar, only in company with a page, that his death might be imputed to the waves and not him; whence the Young Prince (not able to master his passions) cast himself headlong into the Sea and there dyed. Who how unlikely to learn their manners; to get them a Charier; or call them together at York; let the Reader judg. §88. Yet more improbable is it still, that Hen. the 6. and his Council, should ever peruse or approve their charges and manners, and so confirm these right Worshipfull Masters and Fellows as they are call'd in the Scrole: for in the third of his reigne (when he could not be 4 years old) I find an act of Parliament quite abolishing this Society. It being therein ordained, that no Congregations and Confederacies should be made by masons, in their general Chapters and Assemblies, whereby the good course and effect of the Statutes of Labourers, were violated and broken in subversion of Law: and that those who caused such Chapters or Congregations to be holden, should be adjudged Felons; and those masons that came to them should be punish't by imprison­ment, and make fine and ransom at the Kings will. So very much out was the Compiler of this History of the craft of masonry, and so little skill had he in our Chronicles and Laws. Which Statute though repealed by a subsequent act in the 5 of Eliz. whereby Servants and Labourers are compellable to serve, and their wages limited; and all masters made punishable for giving more wages than what is taxed by the Justices, and the servants if they take it &c. Yet this act too being but little observed, 'tis still to be feared these Chapters of Free­masons do as much mischief as before, which if one may estimate by the penalty, as anciently so great, that perhaps it might be usefull to examin them now. The references to Masonic customs as described in the text are easily recognisable in today’s terms. The importance given to this early text is reflected in the study and analysis that has been undertaken by many prominent Masonic scholars in the past such as Gould, Dring and Knoop, Jones & Hamer, amongst others. Thus we find that the content of the text reflects our own understanding and knowledge of Masonic practices. His most consequential statement, however, lies in his mention of ‘large parchment volum they have amongst them, containing the History and Rules of the craft of masonry’ (§85 line 5). Although mention of freemasonry has been recorded since the 16th century, this is the first and earliest reference we have to what are now known as the Old Charges of the British Freemasons..Notwithstanding the fact that some fifteen Old Charges have been identified prior to the publication date of the Natural History of Staffordshire in 1686 there is still no known copy of any earlier Old Charges in which all of the details given by Plot can be found. Accepting the fact that much of Plot’s statements are true and correct as evidenced by other sources, the question still remains: where did Plot get his information? Specific statements by Plot have been identified and sources traced to earlier manuscripts, as for instance his reference to ‘. . . the candidates present with gloves, and so likewise to their wives, and entertain with a collation according to the Custom of the place:’(§86 line 3). This has been sourced to Schaw Statutes of 1599 and Elias Ashmole’s diary entry dated 10 March 1682, respectively. Robert Plot’s close association with Elias Ashmole and the latter’s immediate entourage of Freemasons may well have been an opportunity for Plot to get an insight into some aspects of the Craft. Much of his information may have also come from the four page ‘questionnaire’ which was sent out by Plot to the residents in Staffordshire prior to his journey to write his History. The ninth of the ten headings on the form related to all matters ‘Concerning Arts’ in which he asked for information on trades peculiar to the locality, assuring the contributor that ‘ . . . this design desires not to dive into the mystery of any Trade, but only to represent matter of fact . . .’ . The responses may well have included references to Freemasonry and the activities of the fraternity as later described by Plot in his own words in his tome. Sadly, there appear to be no surviving examples of the responses. As to the Old Charges, suggestions that Plot actually had access to the Sloane MS of 1646 have been dismissed on the grounds that more would have been made by Plot had he had such access and that, in any case, the Sloane MS was likely to be of a much later date previously thought. The closest Old Charge to the text cited by Plot is the William Watson MS No.2 attributed to the 17th century, in which the history of the Craft appears very similar, though Plot did not use sufficient excerpts from the large parchment volum he mentions, to allow fuller comparison, both of which can be traced to the 15th century Cooke manuscript. There is a possibility that Plot saw and used the Wilson manuscript, although this too has been put into doubt by Bro Begemann. There is no doubt that Plot’s text is written in his own words and not transcribed from any other document. The importance and academic value of Plot’s History of Staffordshire as a Masonic source of reference is unparalleled and indisputable. In the listing given by Gould in his The History of Freemasonry on Versions of the Old Charges, ‘Dr Plot’ is listed as No 40 under the heading of Printed Copies, Extracts or References (Vol I on page 73). Dring, E H A Tentative List of English References and Works on Freemasonry, published before 1751 AQC XXV (1912) The Natural History of Staffordshire is listed as No 9, preceded by earlier tomes in which Freemasonry or related themes are mentioned. Knoop, Douglas, Jones G P & Hamer, Douglas Early Masonic Pamphlets published by QC Correspondence Circle in 1978 quotes the Plot text, as the fourth entry, in toto. Penned by James Hughan as the title to his book published in 1872. Begemann, Wilhelm Dr Robert Plot p 121 AQC 6 (1893). Vide Michael Baigent’s searches in the archives of the Royal Society as described in his article in AQC 107 pp 233-235, though his interpretation of the word ‘Mysterys’ is erroneous. The word has no connection to secrets and mysteries but is, in fact, derived from the French métier referring to the trade of Masonry. manifesto of the Lodge of Antiquity in 1778 and that the actual document was only finally found by AFA Woodford who published it in the Masonic Magazine in 1876. The most comprehensive and detailed recent analysis of the Old Charges from every aspect is to be found in Wallace McLeod’s ‘The Old Charges’ published, inter alia, in Heredom, Vol. 14, 2006 and first presented as the Prestonian Lecture for 1986.